At the rate the New York Yankees are picking up injuries, who’s to say Jacoby Ellsbury won’t be starting in the outfield in the next two months. Imagine that, the oft-injured paraplegic might be the one to save the day. Highly unlikely, but with Aaron Hicks suffering through a stiff back and Clint Frazier striking out more than Giancarlo Stanton, he just might be the best option the Bombers have. Hicks is scheduled to miss the first series of the regular season, which isn’t much, but back injuries linger and can cause problems down the road. With players like Stanton who don’t normally feature on the defensive side of the ball as most, having a healthy outfield is essential. But, this season was expected to be a bit different, with Stanton featuring in left field while Hicks and Judge retain their normal spots. Now, experienced veteran Brett Gardner will take over in center, which shouldn’t worry us defensively, but offensively his will fall short of Hicks’ usual numbers. Last season, Gardner slashed .236/.322/.690. His batting efficiency has dropped off significantly in recent years, but he’s undoubtedly the next best option being that Frazier is destined for Triple-A after striking out 11 times in 37 at-bats this spring. The hopes were that Frazier could step up and get past his migraine ailment and become a reserve outfielder with starting capabilities. That dream was shot down as quick as Aaron Judge’s fifth homer of the spring. But, when one player comes up short, an opportunity arises for another. 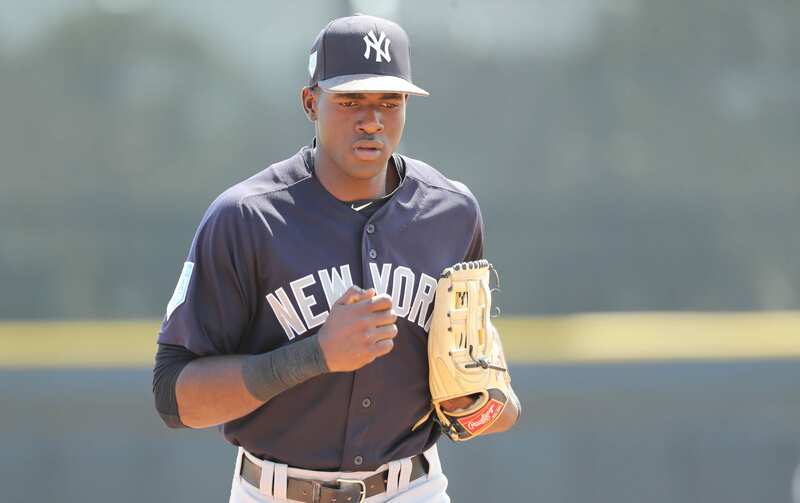 Top prospect Estevan Florial has looked dominant at the plate and defensively in center field. Up until last week when he fractured his risk, there was a real chance he could have earned an opportunity in the big leagues. Hitting .355 with 11 hits in 31 at-bats surely rose his stock going into the final week of spring training. Again, injuries plague the Yankees early one, and the outfield could be in trouble if they can’t escape the contagious bug.